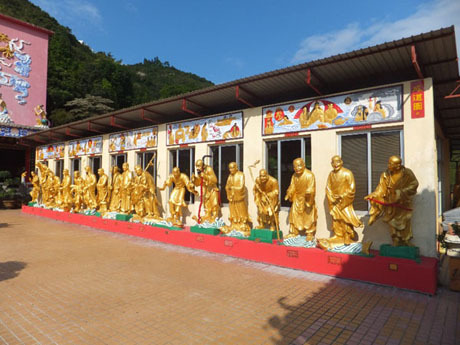 The Ten Thousand Buddhas Monastery (Man Fat Tsz), located Po Fook Hill at Pai Tau Village, Sha Tin in the New Territories is one of Hong Kong’s most famous Buddhist temples and popular tourist attractions. The temple was founded in 1949 by the Reverend Yuet Kai and completed in 1957. The monastery is not residential and is managed by lay-persons. It should not be confused with the Po Fook Hill Ancestral Halls which lie directly below it. The Reverend Yuet Kai, born into a wealthy family in Kunming in southern China in 1878, was a skilled lyre player and talented poet, who studied philosophy at one of China’s leading universities. At the age of 19 he decided to dedicate his life to Buddhism and is said to have set fire to flesh, cut from two of his fingers, to light forty-eight oil lamps in front of the Buddha to demonstrate his commitment to the faith. In 1933 Yuet Kai moved to Hong Kong to preach Buddhism in a local monastery and soon found many followers. 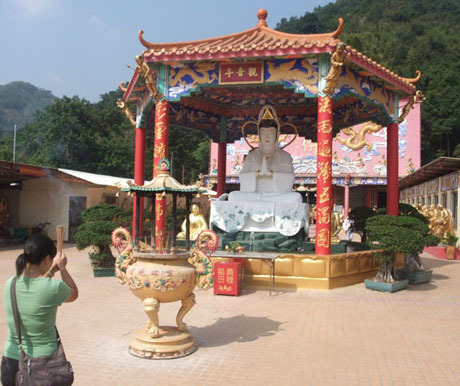 He originally planned to establish a Buddhist college on an estate donated by a wealthy merchant who was also a devout Buddhist but eventually decided instead to found a monastery and construction of the Ten Thousand Buddhas Monastery began in 1949. 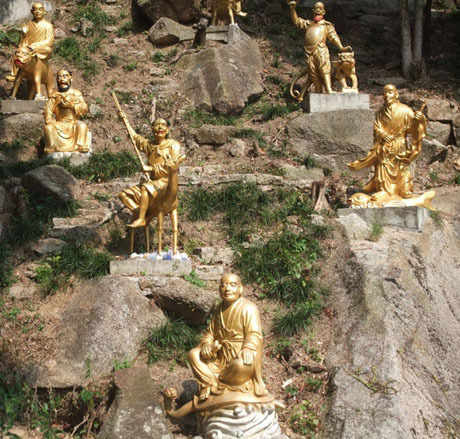 Yuet Kai himself, although by now approaching old age, personally helped in the construction by carrying materials, with his disciples, from the foot of the mountain. The monastery buildings were completed in 1957 but it took a further ten years to complete all the miniature Buddha statues, now on display around the walls of the main temple and which actually number almost 13,000 (in Cantonese tradition “ten thousand” simply represents a figurative term for an extremely large number). The Reverend Yuet Kai died on 24th April 1965 (23rd March in the Chinese Calendar) at the age of 87. After being buried for eight months in a coffin on the hillside his body was exhumed, still in perfect condition, and in accordance with his wishes, embalmed with Chinese lacquer, painted with gold leaf, draped with robes and put on display seated in the lotus position in a glass case in front of the main altar. The corpse is named "The Diamond Indestructible Body of Yuexi" on monastery signs. 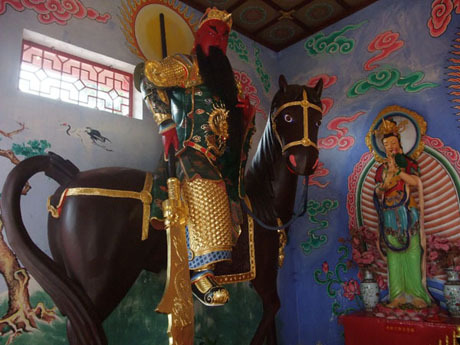 The monastery was substantially redecorated in 1968, some of the pavilions were rebuilt and all the statues were repainted or coated with pure gold. Severe flooding and landslides in 1997 caused major damage to the monstery and some buildings were destroyed. The monastery was closed to the public for two and a half years for reconstruction which still continues today at the monastery’s upper level. 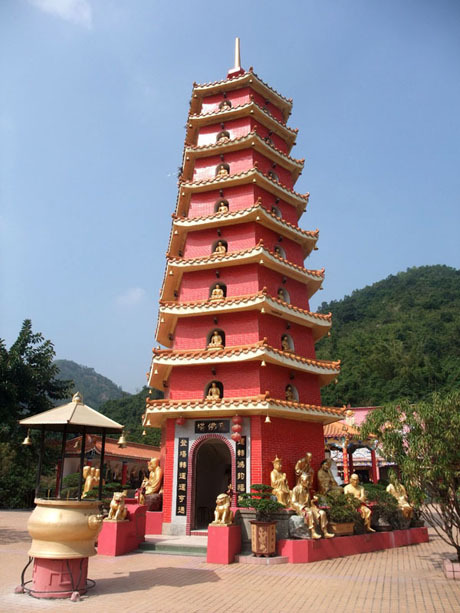 The monastery is built over two levels on a bamboo forest hillside overlooking Sha Tin and occupies an area of over eight hectares. It has five temples, four pavilions, one verandah and a pagoda and is reached by a steep concrete path with 431 steps. 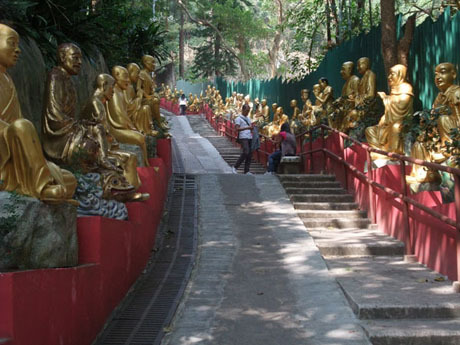 The path is lined on either side with 500 life-size gilded Arhan statues. At the top of the path is the lower level terrace where the main temple (Ten Thousand Buddhas Hall), Avalokitesvara (Kwun Yam) Pavilion, Samantabhadra Pavilion, Manjusri Pavilion, 18-Arhat Gallery, Naga-puspa Hall and 9-storey pagoda are located. 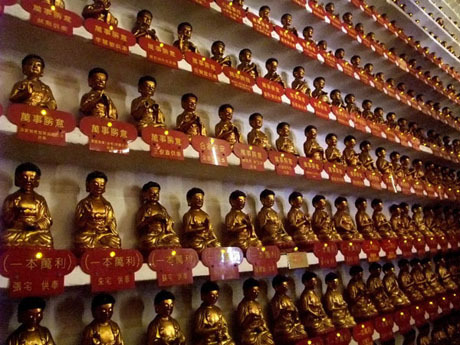 The walls of the main temple are lined with the (almost) 13,000 miniature gold ceramic Buddha statues stacked on shelves. Each statue is about twelve inches high and adopts a different pose and expression and contains an inscription bearing the name of its donor. 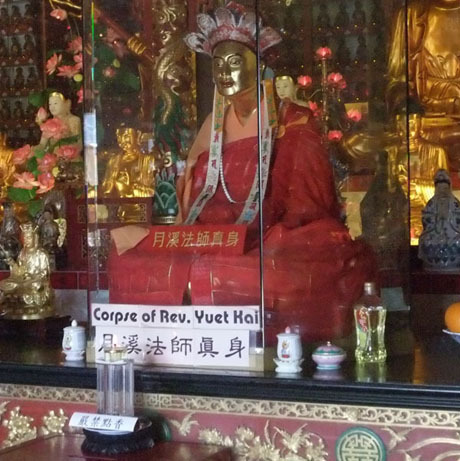 Three large gilded Buddha statues are also on display in the main hall behind the embalmed body of Reverend Yuet Kai, seated in a glass case. There is a small stand inside the main hall selling incense sticks, papers and a variety of souvenirs. 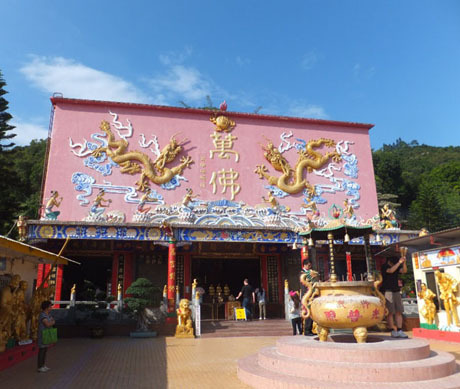 In the centre of the terrace between the main hall and the pagoda stands the Kwun Yam Pavilion flanked a verandah gallery of gold bodhisattvas on one side and the 18 Arhat Gallery of Arhan statues on the other, with various other multicoloured statues dotted about the terrace. 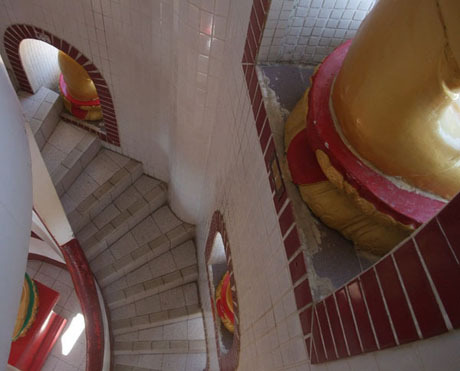 The nine-storey pagoda can be climbed by an internal spiral staircase. At each level are window ledges on which sit Buddha statues and from the top level panoramic views over Sha Tin can be glimpsed. The pagoda achieved some notoriety when, in 2001, it was selected to represent the symbol of Hong Kong featured on the HK$100 banknote. The lower-level terrace also has a vegetarian restaurant serving snacks and a la carte meals. Beyond the pagoda in a corner of the terrace is another path with staircase leading downhill to Sha Tin also lined with gold statues. About half way along the descent of this staircase, a path branching off to the right leads to Starock Bookstore, run by a local writer and calligraphist (update Nov 2015 Starock Bookstore is now closed), and Wing Wo Bee Farm which, at weekends, often sets up a stall at the foot of the hill selling pure honey produced on the farm. Another 69 steps lead to the upper terrace which contains the Amitabha Hall, Avalotiskesvara (Kwun Yam) House, Cundi House, Ksitigarbha House, Jade Emperor Hall, Sprinkler Guanyin, YueXi Pavilion and Naga-puspa Court. An extension to the eastern end of the upper level opened during 2009 and contains a columbarium (Amitabha Hall) with gold Amitabha Buddha statue, Jizo Temple containing ancestral tablets and Tong Hua/Hua Court containing niches. 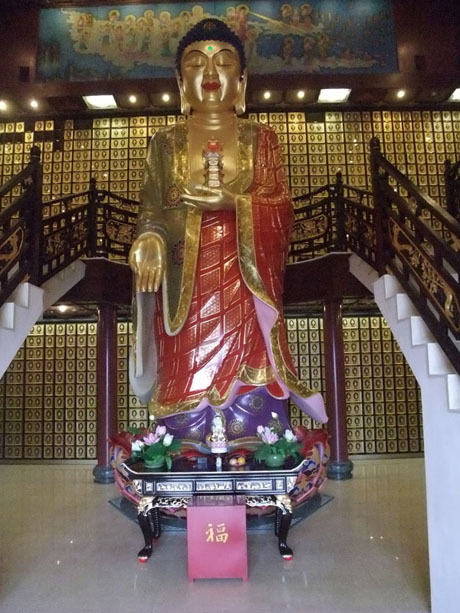 Amitabha Buddha statue in the two-storey columbarium which opened in 2009 on the upper terrace. Gold-framed drawers, each with a Buddha image, stacked around the hall contain ashes of the deceased. 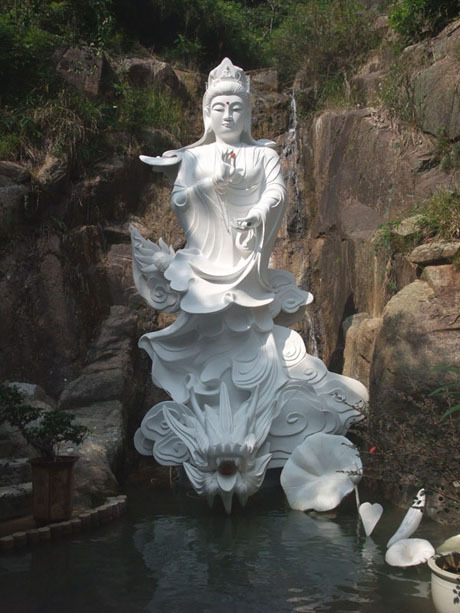 Beyond the eastern end of the terrace stands a huge gleaming white Kwun Yam statue in front of a waterfall overlooking a pond with miniature gold statues perched on surrounding rocks. Construction work at the upper level still continues after many years. OPENING HOURS – Monastery open 9am to 5pm daily. The monastery may close during heavy rain or when typhoon signal 8 or above is issued. Vegetarian Restaurant open 10-30am to 4pm or 5pm, closed Thursdays. GETTING THERE – MTR East Rail to Sha Tin Station*(see note 1 below). From station exit B take the ramp alongside the bus terminus, down to street level and past Pai Tau Village on the left. 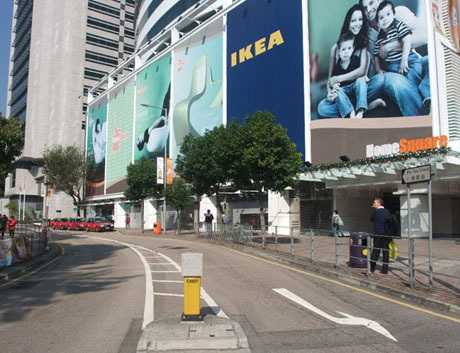 Continue walking forward a short distance to the junction with Pai Tau Street on the left (the distinctive Grand Central Plaza mall which is the location of Homesquare and the IKEA store is directly opposite). 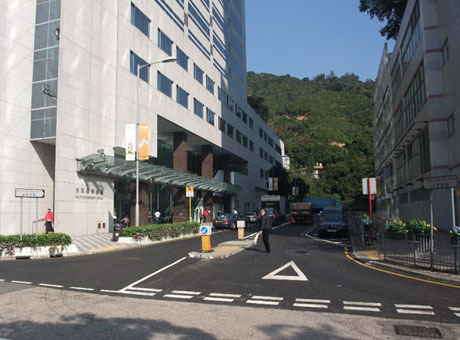 Follow Pai Tau Street and take the first street on the right, Sheung Wo Che Road and follow this street alongside Shatin Government Offices and a multi-storey car park. At the end of Sheung Wo Che Road is a yellow direction sign for the monastery and the path and staircase leading up to the monastery lie about 30-metres beyond. The walk from the station to the start of the path leading up to the monastery takes about ten minutes. 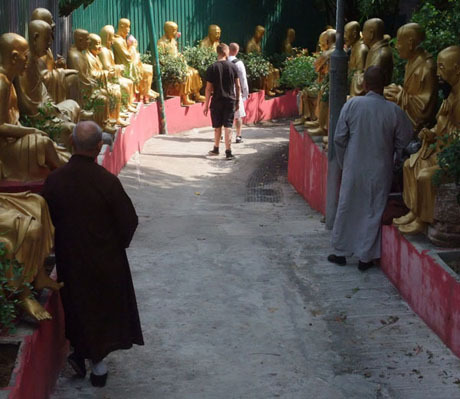 *NOTE 1 - on reaching Sha Tin Station there are no tourist direction signs for the Ten Thousand Buddhas Monastery. 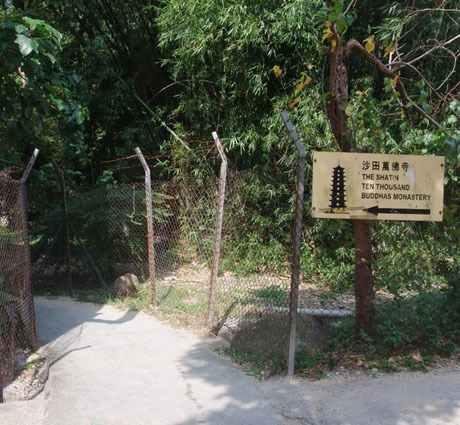 Works for tourist direction signs commenced in 2007 under the Tourism Commission’s Visitor Signage Improvement Scheme but were suspended when the government’s buildings authority requested that Hong Kong Tourism Board (HKTB) do not promote the monastery as a tourist destination owing to safety concerns relating to building works at the monastery site.These concerns still exist and HKTB currently does not promote the monastery in its literature or on its website. On completion of improvement works to the satisfaction of the buildings authority tourist direction signs will be erected. 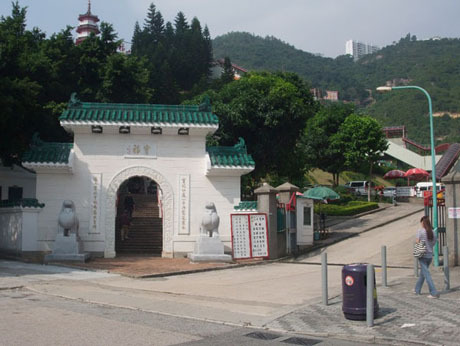 In the meantime visitors can follow the blue direction signs to Sha Tin Government Offices then follow Sheung Wo Che Road alongside these offices to reach the path to the monastery as described above. WARNING - Monks begging for money are known to operate in the area around the monastery. These are fake monks and should be avoided. The Hong Kong Buddhist Association has confirmed genuine devotees are not allowed to beg in Hong Kong. The situation is being monitored by police and there have been some arrests. Most of those arrested were found to have come from mainland China. 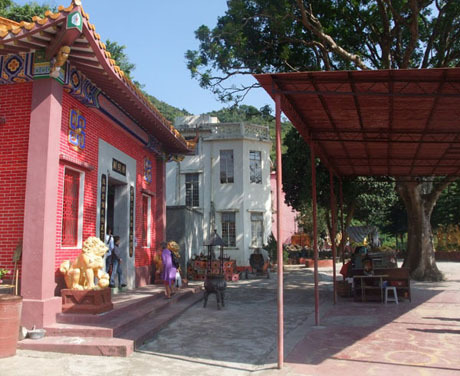 NOTE 2– Po Fook Hill Ancestral Halls lie at the end of Pai Tau Street and are often mistaken for the Ten Thousand Buddhas Temple. These halls are open to visitors (admission free) and served by a series of escalators and a funicular railway. 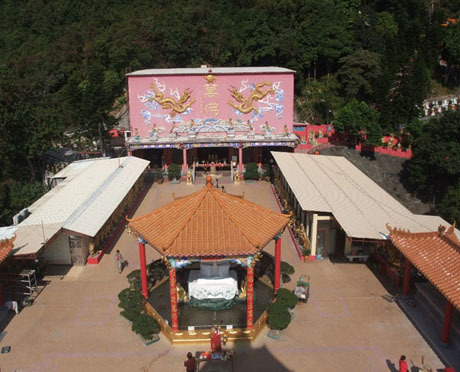 Visitors may wish to take the opportunity to visit these halls which comprise temples, columbarium on several levels of the terraced hillside, a pagoda (entry not allowed) shrines and ponds.